In the rear collar is the Adidas manufacturer’s tag with the player number “24” handwritten on this tag in black marker. Attached to the rear collar is a flag tag reading “MADE IN THIALAND 4XL2”. On the upper right chest and on the back color is an Adidas logo. Across the chest reads “LAKERS” in purple on gold tackle twill. 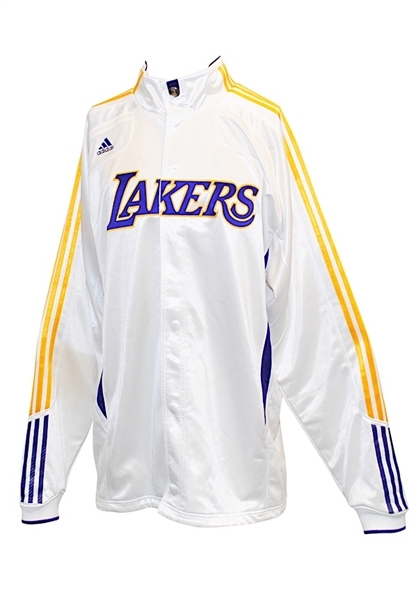 On the back is a Lakers team logo and an official “NBA” logo embroidered. This warm-up jacket is properly tagged and was presented to us as player worn attributed to Kobe Bryant.